Looking for an inexpensive way to help your child learn to read? We created a ‘Word Wall’ of colourful words! Using the scissors, cut the index cards in half. Choose some key sight words – include names, favourite foods, shows & characters – anything that will encourage them to play with the cards. Write one word on each card – capitals at the top of the card and small case at the bottom. Play with them! Display them! Decorate a corner of the child’s play room or bedroom. Give them a chance to be curious. Be open to them asking you questions. Match words that rhyme – cat, hat, sat, mat, etc. Find your family on the word wall – search for mummy, daddy, granny, etc. Find words with similar sounds. Sort them by the number of letters in the word. Find all the words that start with a particular letter. Be creative! See what your child creates too. As my daughter started to learn more words, she would sort them into words she could identify and words she didn’t know. By using the sticky tack, it is easy to keep moving these cards around. If you don’t want to stick things to your wall, you could also add magnets to the back and have them on a magnetic board or the fridge. I’m always looking for ways for child-led learning to occur. I feel like the learning is less stressful and more relaxed. Especially with reading, I didn’t want learning to be a fight or something my daughter started to avoid. I’m grateful that we have a child that adores reading and I will try to encourage that passion. Connect with Sprouting Balance by leaving a comment, following us and SPROUTING a conversation on Twitter – @sproutbalance – and/or liking us on Facebook! Looking for some ideas on recipes, organization or things to do with your Lil Sprout? Come check out my Pinterest page and the things that inspire me to become more balanced. 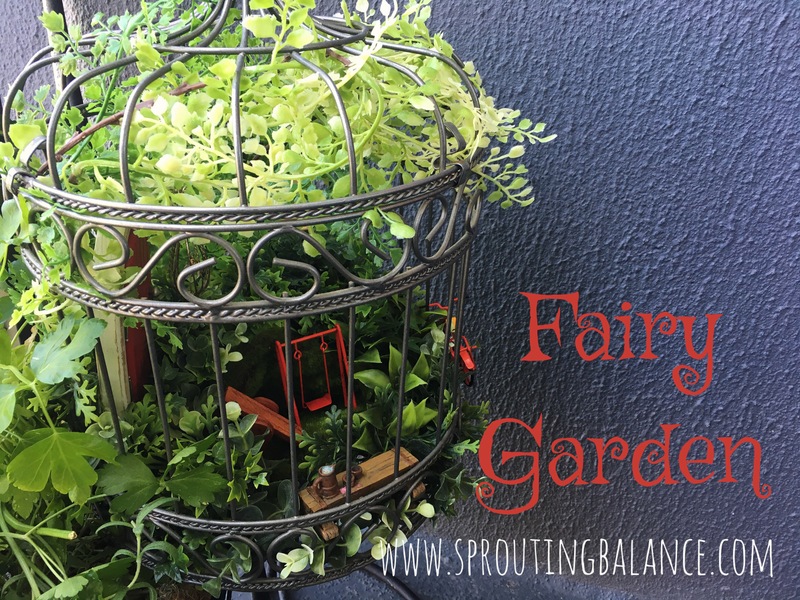 Little fairy gardens have become extremely popular – just look at all the suggestions on Pinterest! For us, it started as a gift for a friend. The birthday party theme was Peter Pan so we gifted her a door for Tinkerbell to travel through. The doors from Sugar Bush Fairies (Orillia, Ontario, Canada) are so adorable that I decided to get us one too. For the longest time, the door has been attached to our TV cabinet in case the fairies wanted to come and snuggle with us. A few months later, we found a little fairy playground at a shop in St. Jacobs. Unfortunately, I don’t remember the company and have come up unsuccessful on my google search. We placed the bike, swing, and seesaw in front of the Sugar Bush Fairy Door. Cute, but the set became annoying – moving it to vacuum and occasionally stepping on it. I knew we needed to make a garden. A year later, I found my inspiration! An ornamental birdcage from Value Village. I dreamt of adding succulents and making it a living feature garden. However, I couldn’t wrap my head around keeping the soil in the cage, the plants alive, and the fairy garden not rusted. Thankfully, Michaels had a 70% off sale on some of their faux plants. Lightbulb moment. We can have a green filled and fun fairy garden without any hassle. Yea! All the greenery went into the cage, fluffed, shifted, tucked, and rolled into a shape that worked. The playground got arranged and the door tucked into the back. The bike got ‘locked’ to the fence using necklace chain. And lastly, a ‘light fixture’ – originally, it was designed by my grandparents to be a necklace pendant. I thought it added some nice vintage flare. I’ve thought about adding some faux lights made from strung beads to the trees. Or bunting. Or little felt clothes on a wash line. What do you think? I need to go to the bead store. hmmm, we’ll drop in after school pickup. I just need to grab one thing. We will be in and out in 5 minutes. I took a five year old into a bead store. A bead store with shiny, bling, bling beads in a rainbow of colours. Mummy, make me a necklace. PPPPLLLLLEEEAAAASSEEEE. And so, this is how this necklace came into existence. My stream of consciousness forgot that dropping into the bead store after school pickup is not efficient and therefore we came home with some bling bling. Hematite to be exact, hematite in a rainbow of colours, and some purple beads in a rubbery texture. Everything got knotted together with a cute little buddha in purple to finish it off. I think it is cute. The kid thinks it is cute. So I guess it is a win. What else have I been making? Check out the Owl Mala and the Choose Happy Bracelet! A sweet little reminder to ‘Choose Happy’. Sandalwood is used in Ayurvedic Healing to promote energy and enthusiasm, while Tiger’s Eye aids in balance and harmony. Add this to a cute little ‘Choose Happy’ charm and who wouldn’t feel a little bit happier? I certainly felt cheerful while designing and making it. And for those that don’t use Alternative Medicine, you have to admit that clothes affect your mood. Sweats make you feel relaxed and slouchy, while a cocktail dress makes you stand a little taller and ready to party. A little reminder to ‘Choose Happy’ might help on those days that require a suit but you would rather be in your pjs. As for me, I will wear this on the grey February days during a Canadian winter to remind me to keep my mood sunny and bright. Do you have an article of clothing that helps you to ‘Choose Happy’? Please share in the comments, on Twitter – @sproutbalance – or Facebook. Meet my latest creation – An Owl Mala. It is an 108-bead hand-knotted necklace with a tube pendant. The pendant was engraved by my grandfather. I don’t wear much gold toned jewelry so I knew it would never be worn on a gold chain. Leather or suede seemed too casual. So it sat in a box until I started to make knotted Malas. I realized that the simplicity of sandalwood allowed the stone to shine. The knotting of the string provided the formality the piece needed. I’m happy that the owl has finally found a woody home. Remember to follow me and SPROUT a conversation on Twitter – @sproutbalance – and Facebook! As a University of Toronto Scarborough Campus alumni, I get the UTSC Commons magazine updating all on the adventures of other alumni, the staff and the campus as a whole. 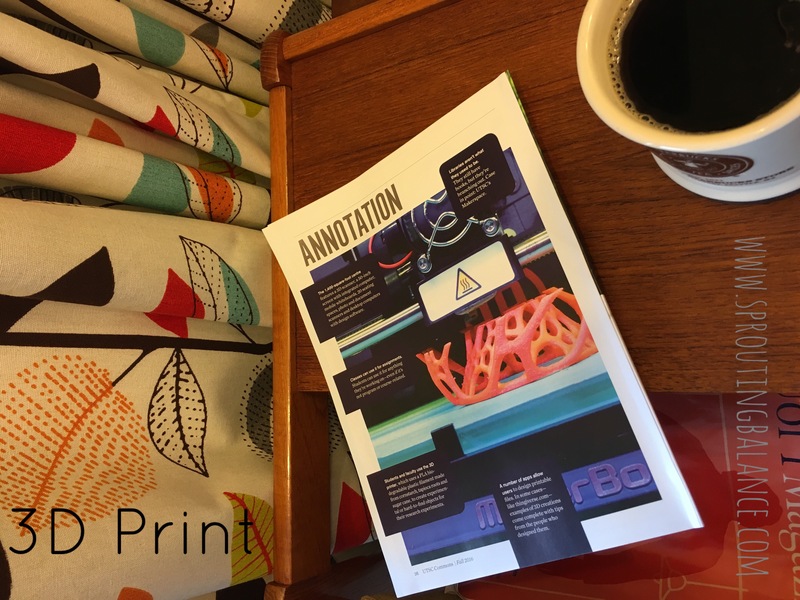 In the Fall 2016 edition, the last page ‘Annotation‘ showcased the Makerspace in the library. It is a 1400 square foot space that amongst other technology, it includes a 3D scanner. Could I please start my degree again?!? I can’t begin to imagine how different an education these students get to receive. To be able to create a 3D model of a building, a chemistry structure or a film prop as part of an assignment. It allows students to think in a whole different plane. And yes, there is an app to make a lot of this possible. If you had access to a 3D printer/scanner, what would you like to create? Would this type of technology have been helpful during your school pursuits? In the comments, please share your answers. Remember to follow us and SPROUT a conversation on Twitter – @sproutbalance – and Facebook!